You know the story of the Ugly Duckling of course, who didn’t look like his family but grew into a beautiful swan? Well, this is a true story of three little chicks who are going to grow into beautiful ducks, as told by Susannah Leigh. It all started when my friend Nic’s very favourite chicken, Rosie became broody. Rosie laid some eggs and sat on them very carefully for a very long time. But the eggs didn’t hatch and Nic realised that they were probably never going to. Sometimes they just don’t. Poor Rosie – all that patient waiting for nothing. It so happens that Nic also had a duck’s nest in her garden. Every day she would watch as the mother duck diligently sat on her nest, warming her eggs. But one morning last week something terrible happened. A fox killed the mother duck in the night. Only her nest of eggs remained. And they were so close to hatching. As Nic was wondering what to do, she heard a clucking from the hen house. Rosie was still sitting patiently on her eggs that were never going to hatch. Nic looked at Rosie and Rosie looked at Nic and in that instant it was decided. Quickly, Nic scooped up the still warm duck eggs and tucked them under Rosie’s feathery bottom. And then she waited – but not for long. The next day when she went to the henhouse, Rosie was still there, clucking proudly. 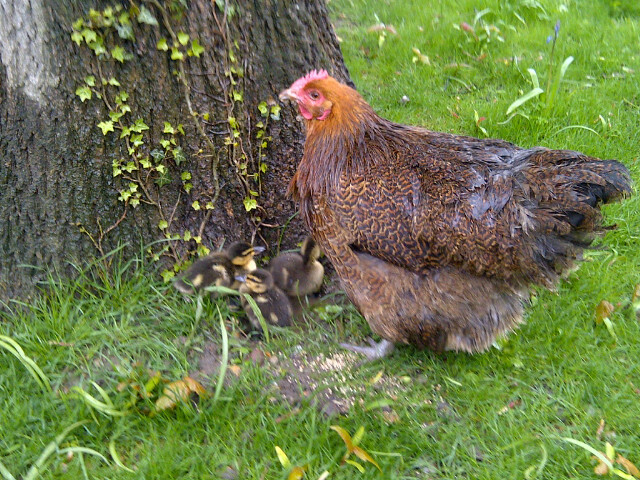 And under her feathery bottom were three tiny little ducklings that had hatched in the night! Rosie is very proud of her little family. And the ducklings love their mummy. They follow her closely around the garden, never leaving her side. Rosie is a very patient parent and only gets slightly cross when the ducklings try to swim in the water tray instead of drinking it. We’re not sure what will happen when the ducklings try to swim properly. I imagine Rosie will get very confused and try and jump in with them, but Nic has a pond in her garden so the swimming will be closely supervised. And there is a nice strong fence now to stop the fox getting in so Rosie and her little family can grub around in the grass happily clucking – and quacking – to each other. Susannah Leigh is a children’s author and editor. 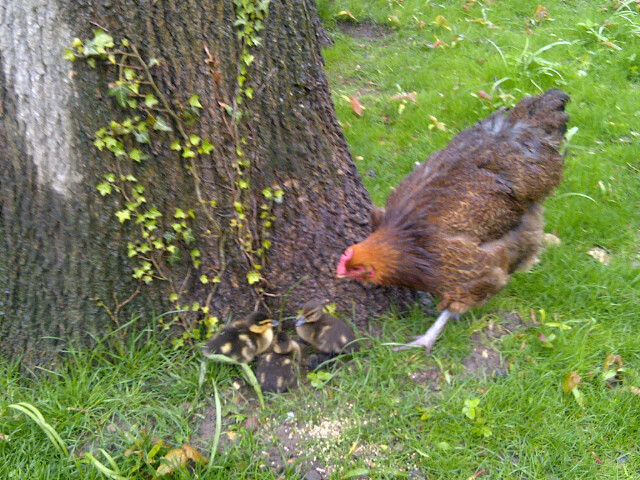 This story is so sweet, I think Rosie looks like a very caring mother, maybe you could call the baby ducks chicklings (as they have a chicken mother but are in fact ducklings)! Oh, I love “chicklings”. That is perfect! What a heart warming read. I hope the swimming lessons go well for the ducklings, and I am sure Rosie is a caring surrogate for those ducklings.